France's avian flu woes continue with the fourth new outbreak of HPAI reported since mid-July, bringing the total to 81 outbreaks from multiple strains of LPAI and HPAI H5 since last November. 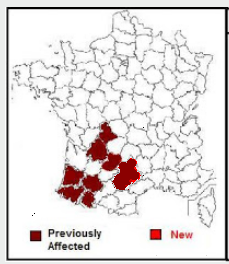 Once again, today's announced outbreak is at a duck farm in Aveyron, very near the outbreak reported last month (see France: MOA Reports 2 New HPAI H5 Outbreaks (Dordogne & Aveyron). Two weeks ago, in DEFRA: Update On HPAI Outbreaks In France, we looked at the latest analysis of these outbreaks from the British government. 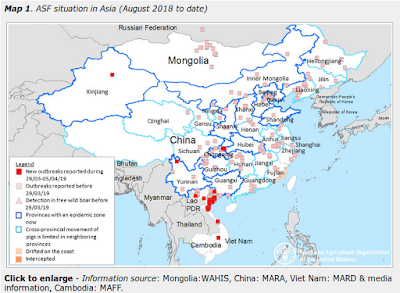 While HPAI H5 viruses (including H5N1), these viruses are not descended from the dangerous Asian H5N1 virus - but are rather of European lineage - and are considered less dangerous to human health. In total, to date, 81 of highly pathogenic avian influenza (HPAI) in poultry were detected in 10 southwestern departments of France. As part of the implementation of an enhanced surveillance plan for the whole country, a new outbreak was detected in the Aveyron. The set of management measures has been implemented. - As part of the programmed monitoring of lifting of the restricted zone, a highly pathogenic avian influenza (H5) was confirmed on 08.05.2016 in a breeding 11 000 ducks ready to gorge, without clinical manifestations, in the town of CRUEJOULS in Aveyron.